Cairns, in Australia’s Far North Queensland, was the cheapest flight I could find from Melbourne on Boxing Day. Going anywhere else was proving too expensive at this time so we decided to do an Australian trip instead of heading overseas like normal. I am so glad this was the case! Cairns is a beautiful place. It is a great place to visit the Great Barrier Reef and some of the world’s oldest rainforests. I already knew I loved it after two visits here in my twenties. I was excited to introduce it to Josh and the kids especially after researching all the best things to do in Cairns with kids. This area is chock a block full with amazing attractions for families. We were not disappointed. This is one of my favourite trips we have done as a family. It’s perfect whether you are looking for an action packed family adventure or a relaxing time at the beach. Below you will find our guide to what to do in Cairns with kids, where to stay in Cairns with kids, Cairns attractions map and other information so you can have a great trip as well! If there is one thing to do in central Cairns, it will no doubt be this – cooling down at Cairns Lagoon. Cairns does not have any nice beaches and this large lagoon style pool means that you don’t feel like you are missing out. In fact, if you are like me and prefer pools to oceans or have little kids then you’ll probably prefer Cairns lagoon over a beach anyway. It’s big with depths ranging up to 1.5 metres. There’s a beach style entry (including the sand) on one side. It’s near lots of shops and eating options as it’s very close to the centre of Cairns. There’s lots of shade but be careful of the birds – one cheeky bugger managed to poo all over me and two of the kids in one go! 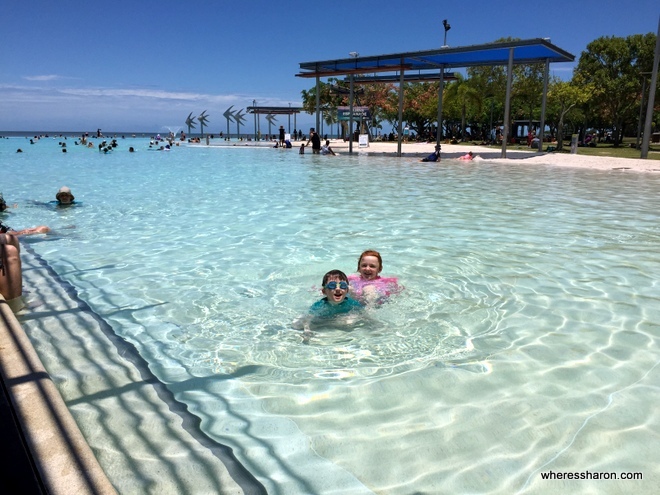 Cairns Lagoon is top of the free things to do in Cairns with kids. It’s open every day with opening hours here. 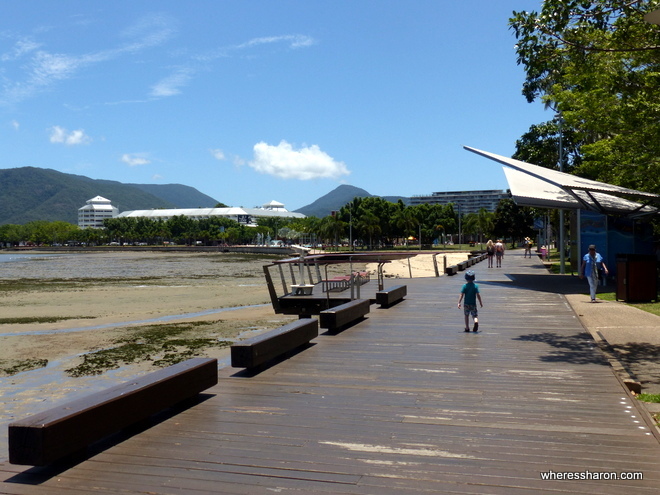 When looking for Cairns attractions for families, you are definitely going to want to visit the Cairns Esplanade. It is a pretty, green area bordering the water in central Cairns. It’s home to attractions such as the Cairns Lagoon and Muddy’s Playground and it’s also a fun thing to do in Cairns for kids by itself. There are good paths – for walking, cycling, blading, whatever – as well as a boardwalk towards the end. There are playgrounds, a skate park, exercise equipment, a market and other things. If you like to keep fit and healthy when travelling then you will definitely want to check out the events Calendar for Cairns Esplanade. There are free exercise classes run seemingly every day including ones where you can take your baby like “mumbalates” and ones in Cairns Lagoon like “aqua zumba”. I am nowhere near motivated enough to do this but it sounds like lots of fun! If you are looking for family things to do in Cairns where you can just hang out with your kids, Muddy’s Playground is a great choice! 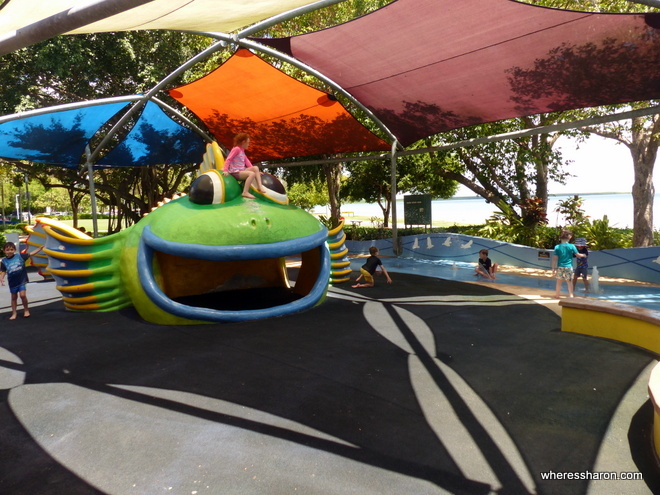 This water playground and regular playground is great fun and located along the Esplanade, not far from Cairns Lagoon. There’s many different playgrounds aimed at different age groups and some water play areas to cool down. The water play areas are best suited to preschoolers and toddlers. In fact, I think this is a better choice for toddlers than Cairns Lagoon. This is because the water playground is mostly just jets of water into the air. It’s not full on at all but lots of fun to splash around. Our 4 and 6 year olds were bored fairly quickly in the water part but the play ground could have held their attention for a lot longer. There is a cafe and plenty of seating space. Currently open between 9am-7pm with some sections closed on Tuesdays and Thursdays. See up to date information here. Of all the things to do in Cairns Australia, this was the top of my list. 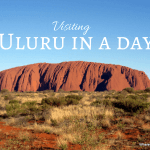 The kids are very interested in Aboriginal culture and this seemed like the perfect opportunity for all of us to learn more – which we definitely did! Tjapukai Aboriginal Cultural Park is run by the Djabugay people who are the local Aboriginal tribe. The centre is set up to share and demonstrate different aspects of their culture and it does a very good job. A day visit consists of numerous demonstrations and shows from learning about bush tucker and how to throw a spear and boomerang to watching the creation story of the Djabugay people. It’s run in a tour format with a performer who takes you around the various activities. It’s an indoor and outdoor venue. Everything is close and easy. There’s also a cafe with very reasonably priced food and drinks. 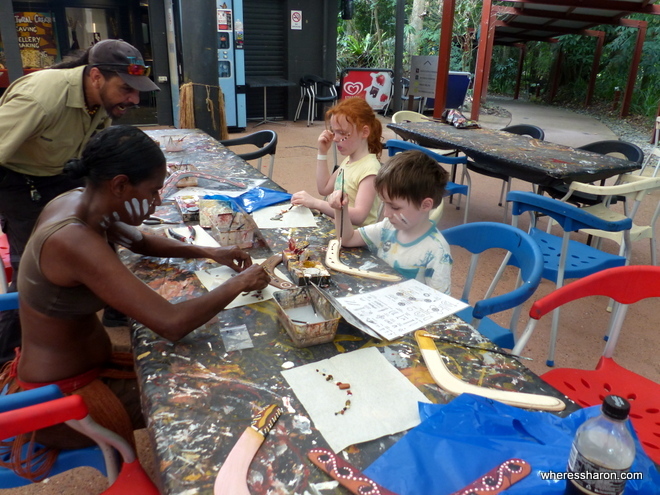 There’s some add ons as well – we did the Cultural Creations which I strongly recommend when working out Cairns kids activities. This involved us painting a boomerang and making jewellery which we got to take home. The kids loved it and it gave us a good chance to chat to one of the performers. I was worried at the beginning that the kids would get bored as it is more adult focused. However, they seemed to lap it all up and were incredibly well behaved which is always a good sign of their engagement. When they were painting their boomerangs, they told a story with their pictures which showed how much they had understood from our morning and I was impressed. There is a surprising lack of easy opportunities to get up close to Aboriginal culture in Australia and I am so glad we took advantage of this opportunity. We learned a lot and I found the centre had a great mix of professionalism yet still being very personal, warm and friendly. The lady who we did the art activities with also took us back to do more boomerang throwing and let us stay as long as we wanted. It seemed like the staff really enjoyed showing off their culture and talking to us, and it really enhanced the experience. There is also a different program in the evening which is more interactive and we will definitely do this next time we are in Cairns. Being located directly next door to Tjapukai made the Australian Armoury and Artillery Museum an easy place to visit. This is the largest museum of its type in the Southern Hemisphere and it’s worth checking out. The museum houses an impressive range of armoured vehicles from around the world, spanning back to the early 1800’s with a particular focus on WWII. The vehicles are very well kept and an interesting look back in history. It is also exciting for any young kids with an interest in big cars, but still more suitable for adults. The museum is easy to access and the layout is easy to navigate and each piece has a detailed description. It is also fully undercover and can get a bit hot inside, but there are fans dotted around. Entrance to the museum is $25 for adults with family prices available. It is open from 9:30am to 4:30pm daily. You can see the full price list on their website. 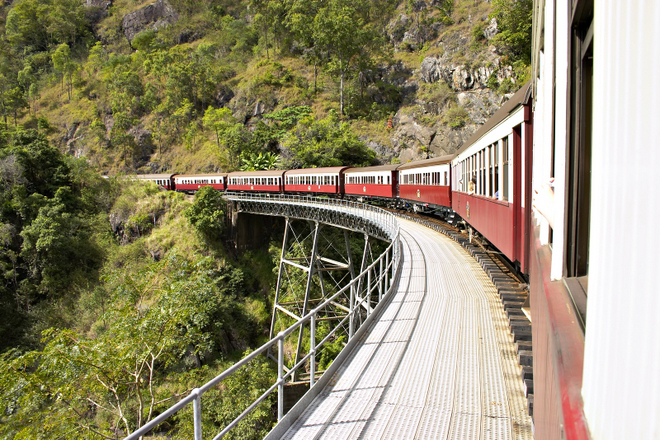 Way back in the 1880s a railway was built between the town of Kuranda, high in the Atherton Tablelands and Cairns. The intention was to build the line out to a town called Herberton but the technical challenge of building a railway over a rainforest covered mountain range saw costs blow out and the government lost interest. However, Herberton’s loss is our gain for what they did build is now a significant attraction in its own right. The Kuranda Scenic Railways is a real engineering feat and a trip on it offers fantastic views of the Atherton Tablelands as the track winds its way along the Barron River Gorge. The carriages all formerly served on the route up to 100 years ago. They’re generally comfortable although where we were first assigned seats was a little squishy until we were moved to another carriage with a smaller capacity (although much the same size). Space aside, the lovely old carriages really add to the experience. The journey is about two hours and this includes a stop at Barron Falls for a chance to see the impressive falls at a distance. The rest of the journey offers fantastic views as well as the train hugs the sides of mountains lining the gorge. One thing to note: due to the carriages there’s restrictions on what prams/strollers can be taken on board. They need to be able to fold up and fit under the seats, which have about 30cm of space under them. You can take the train one or both ways. 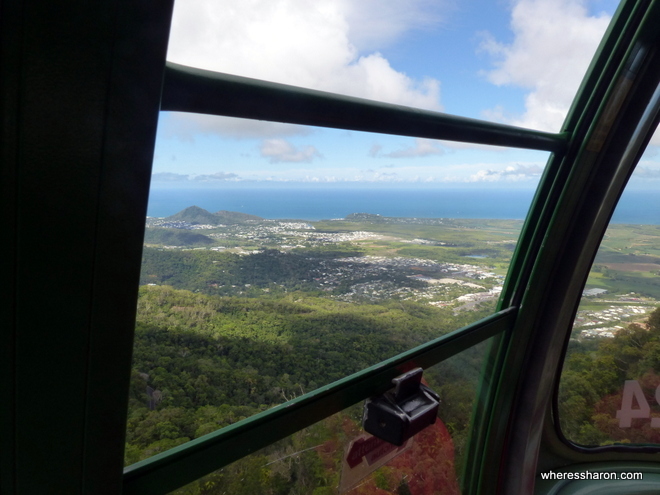 A single leg can be combined with the Skyrail cable car which goes between Smithfield and Kuranda and has connecting buses to get to or from Cairns (and other places as well). I loved the trip and Z enjoyed being on the train and the waterfalls along the way. At two hours it was a bit long for S who was bored. It won’t work for all kids, especially if young and easily bored but the journey is one of the country’s best rail experiences. Currently, two services leave Cairns at 8:30am and 10:30am with the return services running at 2:30pm and 4pm. If taking the earlier train the ticket office opens at 8am. We got there about 8:05am but there was a long queue to buy or collect tickets. Get there early or leave it to the last minute to avoid the queues. You can buy discounted tickets for the scenic railway here. Running almost ten kilometres from Kuranda to Smithfield, north of Carins, is the Skyrail Cable Car. 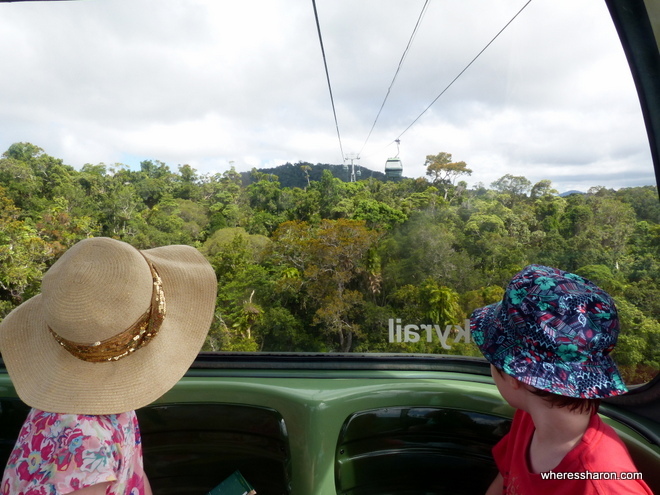 The cable car offers stunning views of the rainforests of the Atherton Tablelands, sometimes from up high, sometimes just clearing the top of the canopy. You can upgrade to a diamond class ticket which gives access to a diamond view car – a car with a see through glass floor or extra viewing awesomeness. There’s two optional stops between the two termini where you can get out and walk along the boardwalks amongst the trees. One is at Barron Falls – allowing for close up views – and the other is at Red Peak, the highest point of the route. At Red Peak you have to change cars as the route is actually two cables and this is where they meet. Both stops have toilets if you need them. Stopping off at both stops and looking around makes the trip end to end take 90 minutes (approximately). We didn’t stop and took under half that. The website claims bookings are essential but you can buy tickets at each end. That said going from Kuranda to Cairns in the afternoon was really busy and staff were enforcing the times on people’s tickets (cars come and go all the time but boarding times are divided up into chunks of day) to help spread the load. Our queue was still long anyway, made worse by the fact that diamond view cabs (of which there are few) were reserved for diamond view class ticket holders and so went empty when there weren’t any. Efficiency and throughput were no match for Skyrail’s strict class system. Prams need to be able to fold up to get them in the cars but as long as they fit without taking up too much room there were no guidelines. This is one attraction S and Z loved way more than me (and the scenic railway). I liked it but the kids loved it. Sitting there just passing over the tops of trees as well as some great views was pretty exciting for them. Hard not for this to be a winner with most kids and families (or most people, really). Journeys can be combined with the train to do a loop through Kuranda, taking the train one way and the cable car back combined with a shuttle from Smithfield back to Cairns either to your accommodation or to Cairns station. You can get a bus to Port Douglas and other places as well. You can buy discounted tickets for the Skyrail here. At the end of both the railway and the Skyrail is the town of Kuranda itself. Given its location as the terminus of both the scenic railway and the cable car, it’s not surprising that Kuranda is very much a town focused on tourism and consequently has a lot of top places to go, places to eat and accommodation options. 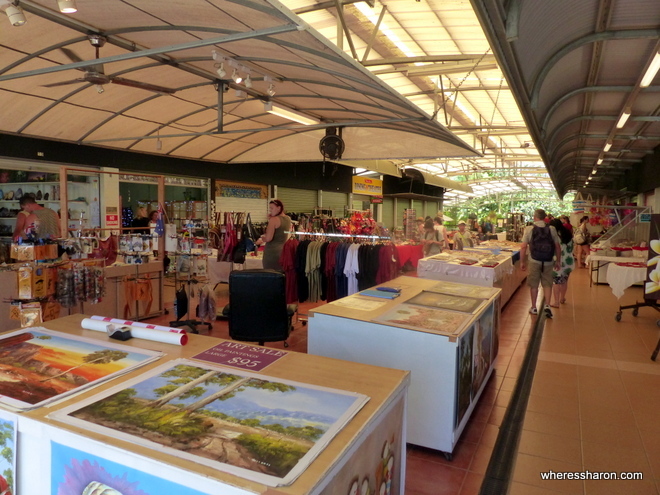 The main attraction of Kurana itself is probably the Kuranda Village markets, located just off the main street, near the tourist office at the top of the hill. On sale there, as well as in many nearby shops, are souvenirs, artwork with local themes and local artisanal foods and beverages. For kids there’s a nice shady playground in the park behind the information centre, which could be a nice place to wait for a shuttle or taking a break between attractions. Kuranda is quite compact and easy to walk, if crowded at times. If you’re feeling lazy there’s a free shuttle that takes you from outside the railway station to the top of the hill outside the bird park and a couple of other places. Rainforestation Wildlife Park is a wildlife park built on a former coffee plantation (which was wiped out by a cyclone). There’s three parts to the park: animal exhibits, an aboriginal cultural centre with dance performances and a tour on genuine amphibious Duck vehicles. You can buy tickets to each separately or buy a ticket to all of them as a package for a reduced price. We didn’t have the time to check out the cultural centre (although we could hear a performance and the music sounded impressive) but we did get to check out the animals and do a Duck tour. The animal space is small but does have a lot of Australian animals. There’s some sleepy koalas, kangaroos, wallabies, wombats, a couple of small crocodiles and some pythons. The wallabies and kangaroos roamed around and some stood still enough for the kids to pat them, which they liked. Due to its size there was 30 or 40 minutes worth of interest for S and Z and at $16.50 for adults/$8.25 for kids between 4 and 15 it maybe overpriced and if you’ve seen and patted these sorts of animals before then it might be too expensive or not compelling enough to be worth it. That said it was nice and the kids did enjoy it. The star of Rainforestation is the Duck tour. 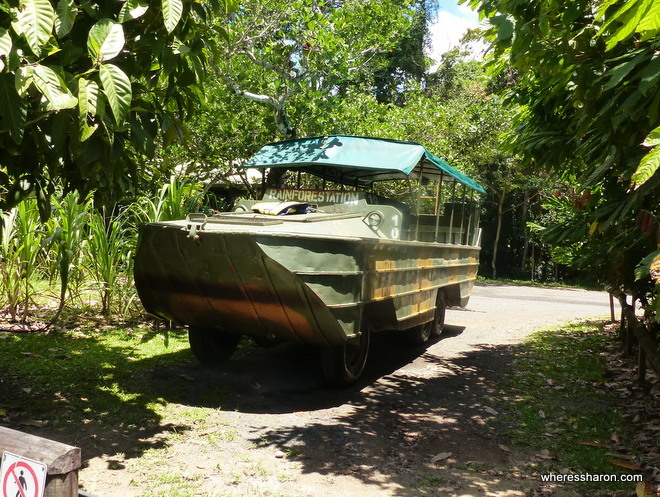 With a large fleet of WWII era Duck amphibious vehicles (named after their General Motors product code – DUKW – added on all their serial numbers) the tours go around the park over land and water. Tours last for 45 minutes and go on the hour. Our driver did a great job of explaining the various plants and occasional animals we saw along the way. We didn’t see much fauna – some butterflies and water dragon lizards, but I found the plants more interesting than I’d have thought. We all loved driving around in the Duck – something about being in an unusual vehicle made it all much more fun. 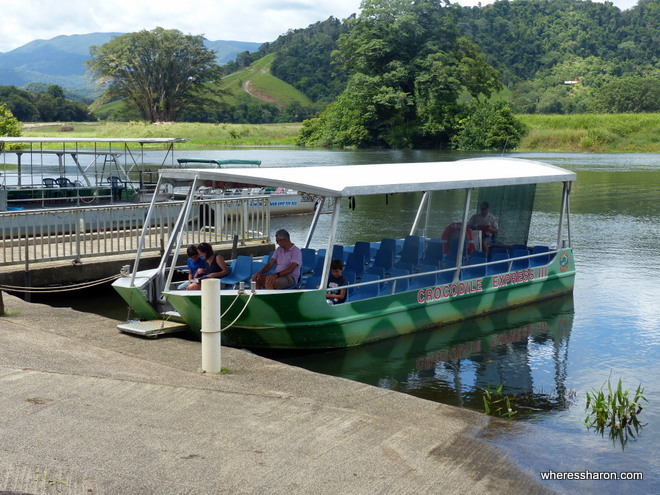 The Duck tour was easily worth going out to Rainforestation for, especially if you are looking for Cairns activities for kids. It’s unusual and unique. The animal section was a smaller version of other wildlife parks so I wouldn’t go there just for that but if you’ve not seen Australian animals up close before or are going for the Duck tour anyway its worth considering. Rainforestation is not far outside of Kuranda. There is a shuttle every half hour throughout the day (at quarter to and quarter past the hour) that leaves from outside of the Butterfly Sanctuary. It costs (at the time of writing) $6/12 per adult one way/return and $3/$6 per child. It can be cheaper and easier to get a taxi – we found the bus kept being reserved for tour groups and waited an hour for one. 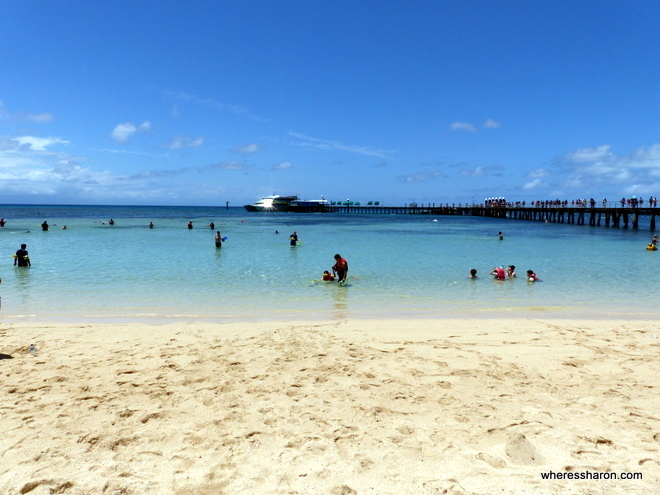 Green Island is one of my favourite places in Far North Queensland which is why when I was researching things to do with kids in Cairns for my first trip with kids to this area, Green Island quickly became the #1 Cairns attractions for kids. Green Island is a small island on the Great Barrier Reef. It’s about a 50 minute catamaran ride from Cairns which makes it very accessible. It’s also a national park and it’s a beautiful spot from which to explore this part of Far North Queensland. Green Island is best visited on a half or full day trip from Cairns. We ended up doing a 6 hour trip, including the ride out there which was perfect for us. There is plenty to do to fill a day. There is also the option to stay overnight which is what we planned to do originally. Then I contacted the resort about the fact that a family package is only for four and found out that to also take our baby, who was 6 months old when we visited, we would have to literally double the price of the family package. At $700 a night this was already a treat and there was no way I was paying $700 to add a baby who wouldn’t be doing the activities or eating the food anyway. I am not sure how the resort thinks this is how a family friendly accommodation provider behaves but I will end my rant here before I turn you all off, as Green Island is an excellent place to visit with kids. Thankfully, it’s also a great place to visit for a day trip and I’m glad my frustrations with the resort did not stop me from going to Green Island all together. 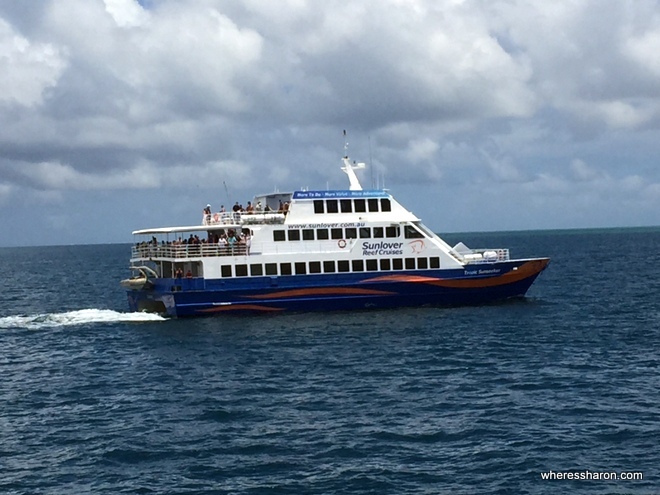 The catamaran ride from Cairns is in quick, easy and smooth. We arrived about 9:30am and went straight on a glass bottom boat tour which was included with our ticket to Green Island (more below). 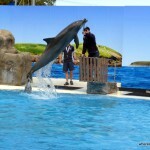 We then visited Marineland Melanesia (more below) before a leisurely lunch and a swim. There’s a “food court” area with several eating options. We ate at the bar and had some yummy salads and prawns. The prices were reasonable especially considering options were limited. There’s a pool on the island which guests of the resort and people with a Great Adventures ticket can use, although in reality no one was checking. After lunch, S and Josh went snorkelling while Baby J, Z and I explored more of the island. It’s not that big and very pleasant to walk around with trees everywhere to keep things cool. 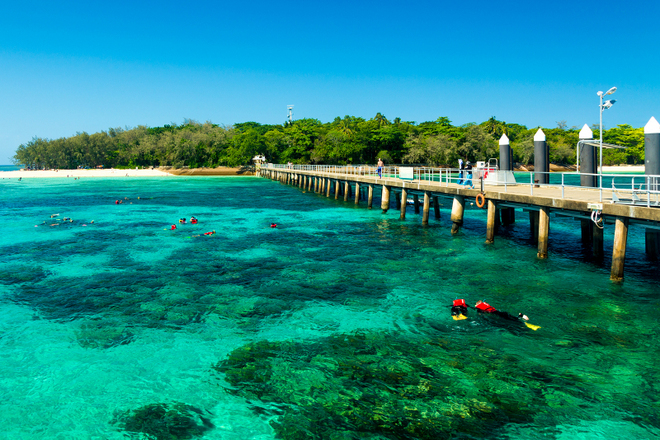 Green Island is surrounded by coral and the Great Barrier Reef which is part of why it is so popular. It’s very easy to snorkel right off the beach, although stinger suits (read full body lycra suites!) are recommended because of the possibility of poisonous jellyfish in the water. S had her first snorkel in the ocean and it went very well. She loved snorkelling over the coral and the fish and it made her very determined to also snorkel on the Outer Barrier Reef. At this point, I want to say that Green Island a lovely place to snorkel and dive. I’ve done both in the past. I do want to say, however, that it does not compare at all the Outer Reef. I have read a few bloggers dissing the Great Barrier Reef saying that it wasn’t as good as they expected but they had only snorkelled places like Green Island. This frustrates me. If you have come this far to see the Great Barrier Reef then don’t be tight at this point and only come this far. You do need to go to the Outer Reef. In saying that, it is a very accessible place to snorkel and it is good. It’s probably a better alternative with young kids like ours to visiting the Outer Reef as it’s also a great island. Just don’t do this as a replacement for the Outer Reef or expect it to be the same. Finally, we had an easy catamaran ride back to Cairns. We were all sad that our day had come to an end. It was brilliant! We did a tour with Great Adventures. You can buy discounted tickets for this same tour here. Baby J was free. Green Island is pram friendly. 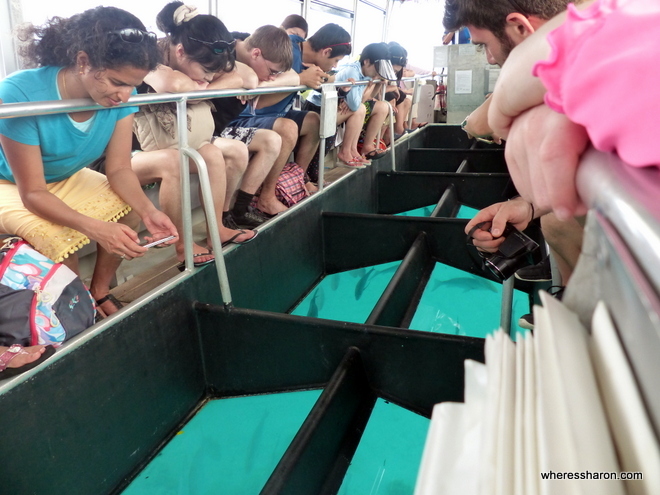 One of the kids activities in Cairns that worked very well for us was a glass bottom boat tour. These are exactly what they sound like – a tour in a boat with a glass bottom so you can see the coral and fish below. 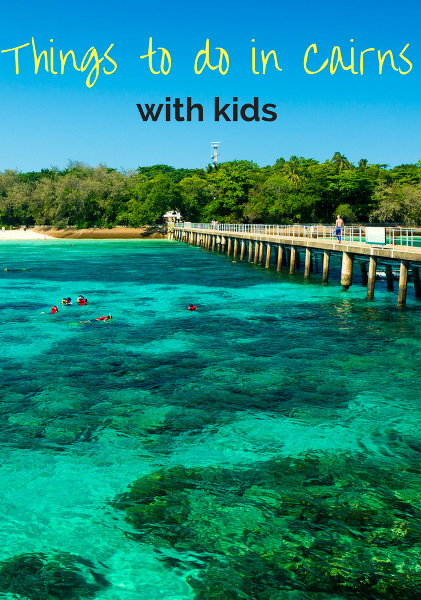 They are perfect for kids that are too young to snorkel and fun when you are older too. We had a glass bottom boat tour included in our ticket to Green Island and you can do these tours there. It’s quick and easy. It’s also possible to do them at other locations in the Cairns areas like at one of the platoons where some of the Outer Reef tours go. Marineland Melanesia is basically a small crocodile park on Green Island. There are some aquariums with fish and coral, many sculptures and artefacts from indigenous cultures of Australia and surrounding countries and quite a few big crocodiles. The crocodiles are definitely the highlight and you definitely should time your visit for crocodile feeding time which took place at 10:30am and 1:30pm when we visited. Our guide joked that it is a crocodile prison – the crocs here are all ones that have been captured because they were trouble makers – attacking boats or people. Seeing the guide feeding the crocodiles was only part of the experience – we learned a lot about the crocodiles themselves and it was quite an experience to be so close to such gigantic creatures. I had no appreciation for just how massive they are. I filmed the below video myself – the massive Cassius was that close. It was a bit scary even with a fence between us. The guide was absolutely great and I thoroughly enjoyed my time here, as did the kids. Z was so excited we had to buy a postcard and send it back to his kinder so he could tell them all about it! Marineland Melanesia is very easy to find. There are signs to follow as soon as you walk onto Green Island. Find more information on their site here. If you are researching what to do in Cairns Australia what you are probably going to see most is to go to the Great Barrier Reef. This world famous attraction simply should not be missed and I highly recommend you take an outer reef tour to check it out. There’s a wide range of tours going to different reefs or locations and most offer the chance to snorkel, dive or “seawalk” (where you wear a spacesuit style helmet and walk on the sea floor). Or all three. There’s a few styles of tour available. The first one I looked at involved a boat touring the reef stopping at three different locations to snorkel or dive. It looked really good but was sold out on the days we were in Cairns (learn from this and book ahead!). S and I ended up going with an option from Sunlovers that goes to a permanently moored pontoon on Moore Reef. What the pontoons lack in location variety it makes up for in facilities and choices in activities. 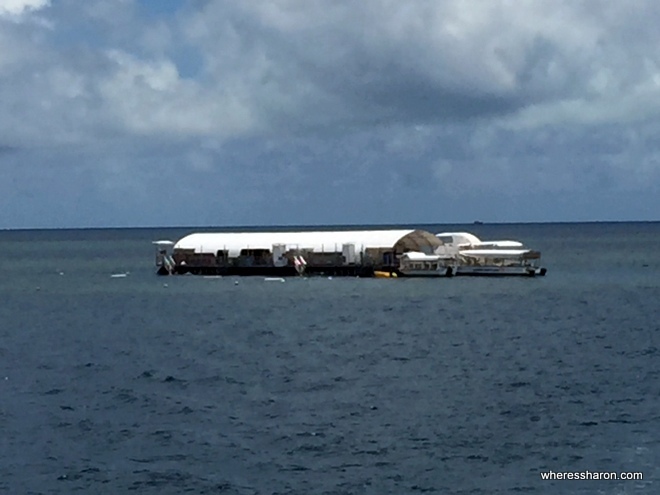 Many tour operators have their own pontoon at different reefs. Sunlover’s pontoon offered glass bottom boat rides, a touch tank and snorkel tours led by a marine biologist all included in the tour price. Most (if not all) have well marked safe swimming/snorkelling areas with buoys spread out to cling to for a rest and lifeguards keeping an eye on everyone. It’s a great choice for families. 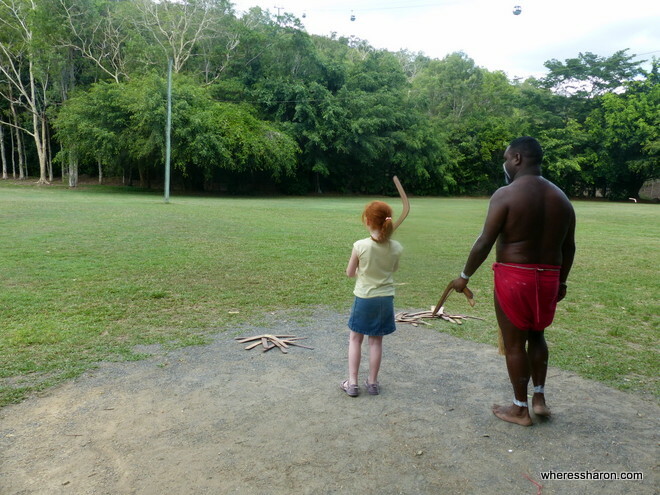 Some tours will also combine one of the above options with a stop at an island like Green Island or Fitzroy Island. All but the cheapest tours include the use of snorkelling gear, lunch on the boat and water (with a bar available for other drinks and snacks). Our boat was very comfortable and the lunch buffet was small but with a good selection of warm dishes and cold salads with prawns and other cold meats. The only thing we needed to pay for was lycra body suits to protect us from jellyfish stings at $5 each. They also did a great job in protecting us from the sun. Our boat took just over 90 minutes to reach Moore Reef. On the Sunlover website this tour was due to stay at the reef for four hours. However due to the busy time of year, Sunlover run two different boats (as do other operators) and the time at the reef was shortened to just under three hours. Given they start getting you back on the boat 20 minutes before departure we had just two and a half hours to do everything including lunch. This is my only complaint – everything else was great. However, I’d have loved more time at the reef, it was easily worth the effort. It would have also been nice to have been informed when booking that the tour was going to be shortened. I suggest asking for specifics on this when you book. For families, the pontoons are a great choice. There’s a real variety of things to do and families can split up with some doing a glass bottom boat tour while the rest snorkel, or eat, or explore the touch tank. For snorkelling it’s easy to get into and out of the water using especially made platforms with somewhere to sit to put on or take of flippers. It’s designed for all ages and swimming abilities. There’s a kid’s pool on the side so young kids can swim in the ocean without being able to float away and there’s plenty of lifeguards watching for the slightest sign of trouble (one would jump in as soon as anyone even looked remotely in difficulty). Older kids who can swim could even be left to snorkel or swim on their own. With flippers and a buoyancy vest, 6 year old S handled the ocean easily. And the reef itself? Worth the effort. Because it was cloudy most of the time the coral looked a little dull and the water slightly murky. When the sun came out the water was crystal blue and colours were a lot more vivid. It was the fish that were the highlight – so bright, so close. Amazing. S kept laughing and squealing with wonderment and joy at being able to see all the fish up so close. If I get the chance I’d do it again, hopefully with Z as well. You can find details of the tour we did here or you buy discounted tickets for a similar tour here. 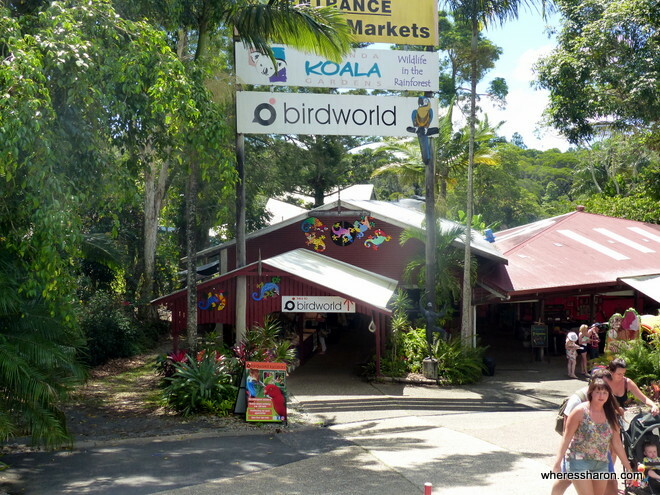 If you are looking for things to do in Kuranda and like birds, try out Birdworld Kuranda. Here you will find 60+ species of native and exotic birds in one of the largest free-flight aviaries in Australia. You can watch them all flying around their rainforest habitat. You can also buy food to feed them. I must admit that we did not get to this attraction. We did a day trip to Kuranda and found that Rainforestation and looking at the town filled up all our time. 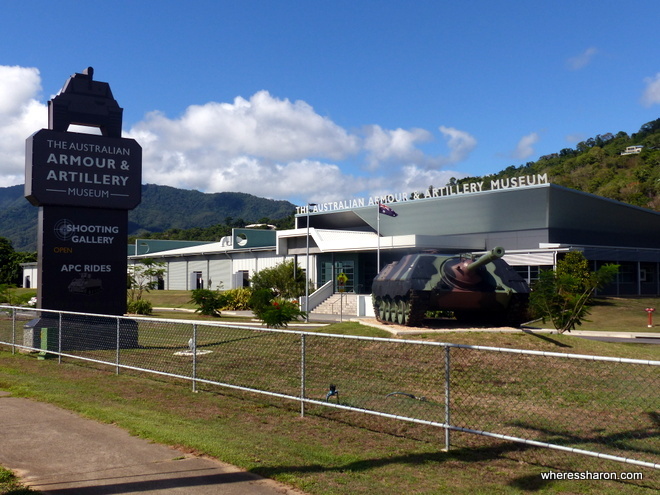 However, if you are looking for a smaller attraction where you don’t need to leave Kuranda, then this or the following two Kuranda attractions are a great choice. Find more information on their website. You can buy an individual ticket to this attraction or a combination one with the next two attractions. Another of the Kuranda things to do is located at the same spot as Birdworld – Kuranda Koala Gardens. Here, you can see Australian wildlife up close, particularly koalas, crocodiles, kangaroos, wombats, snakes and other reptiles. There are lots of opportunities to check out koalas, in particular, and you can also hold one. 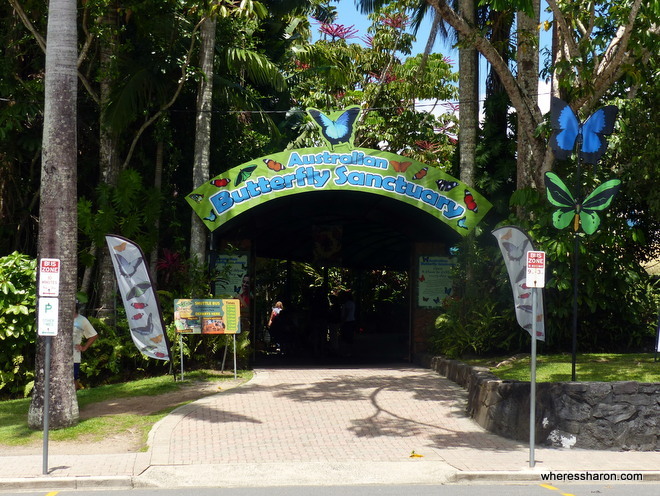 Another of the small animal attractions when you are looking for what to do in Kuranda is the Australia Butterfly Sanctuary. It’s located in the same area as the Koala Gardens and Birdworld. Here, you will find the Southern hemisphere’s largest butterfly light aviary. It’s home to over 1500 butterflies and suitable to visit in all weather. There’s free guided tours at various times of day. You can also see the breeding laboratory with over 4000 caterpillars! 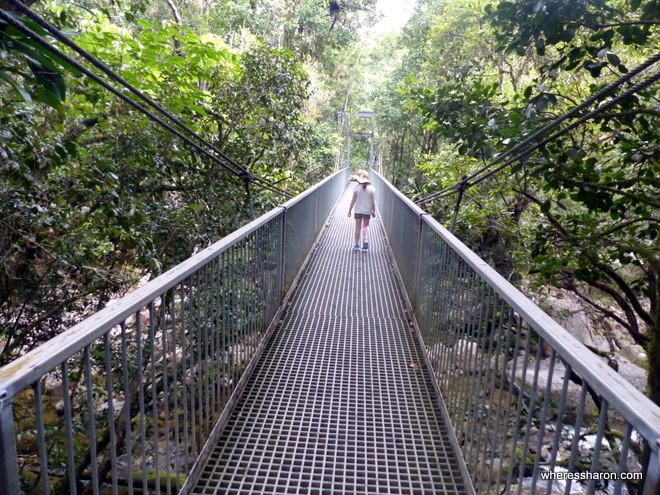 Mossman Gorge is a great choice when looking for Cairns things to do with kids. It’s about an hour and a quarter’s drive from Cairns or close to Port Douglas. This beautiful gorge is a popular place for a swim or to go hiking. There’s some easy, pretty walks which make it a great place to visit with kids. 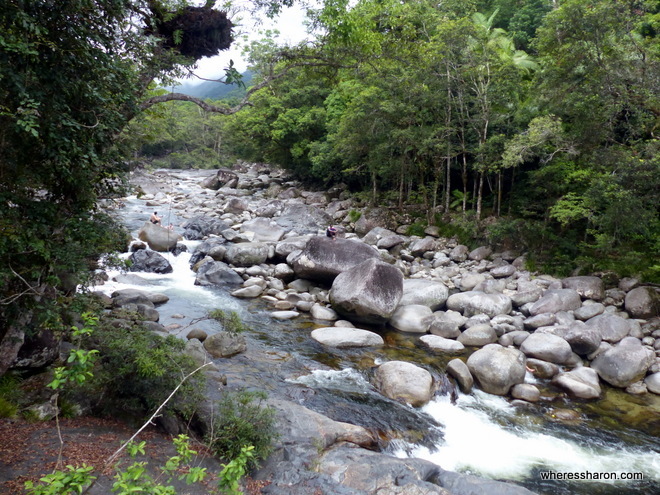 To visit Mossman Gorge, you first need to make your way to the visitor centre. From here, you can walk the four kilometres to the gorge along a road or you can pay for a shuttle bus. The Aborigines who live the town along the way, ask you to take the shuttle rather than walk which was a good enough reason for me. The bus runs every 15 minutes and is quick and easy. It dropped us off at the entry of the Gorge area. From here, it was a super easy walk along a boardwalk in the rainforest to the main Gorge area including a viewing platform. Along the walk, there are some interesting information boards which taught as more about the rainforest. The walk was less than ten minutes. Apart from the stairs down into the Gorge, it is pram friendly. Many people were swimming in the Gorge but there are lots of signs advising against this. We also walked on to a suspension bridge which was another 5 minutes and lots of fun. Our visit here was lovely and I recommend it a lot if you want an easy, lovely walk with young kids. Find more information here. A family pass for the shuttle is currently $22.80 return. The Daintree is a word which is synonymous with rainforest for me which is no surprise since it is the oldest surviving rainforest in the world. Thankfully, it is also very accessible on a family trip to Cairns. 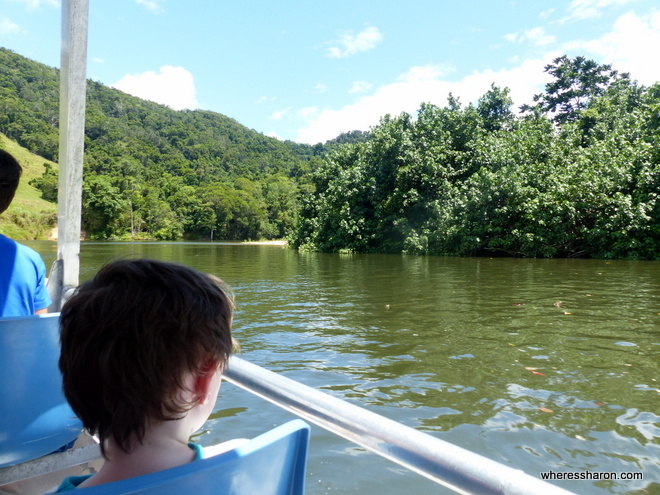 We decided to see the Daintree from a river cruise, specifically one where we could search for crocodiles. This is easy to do. 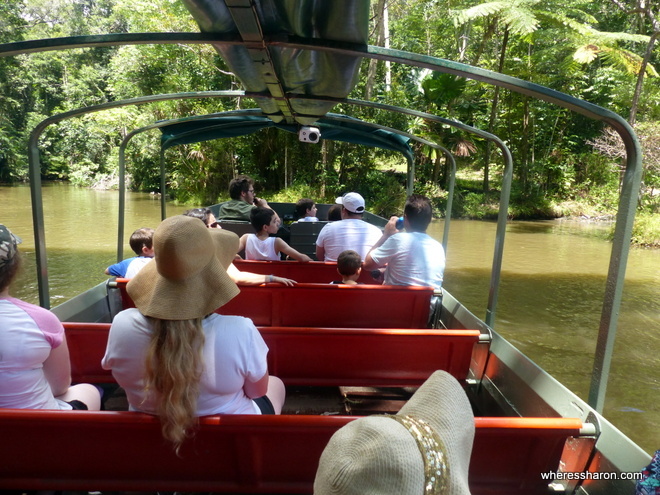 We took a one hour Crocodile Express river cruise from Daintree Village which is an easy drive from Port Douglas. The boat is small and I must admit that I was a bit scared. After seeing crocodiles up close at Marineland Melanesia a few days previously and realising how huge they are and how big they can jump, it didn’t seem safe! I was assured that it is and that one of these boats had only been attacked once – when a guide went too close to fighting crocodiles. The kids thought it was super cool and liked looking for crocodiles. I resisted the urge to pull them into the middle of the boat! The cruise went for an hour and we were able to see more of the Daintree which was the main aim. I found this disappointing as I had expected to be surrounded by massive rainforest. There are some pretty views but a lot of the surrounding land has been cleared for farms. We unfortunately did not see any crocodiles. We were there at high tide in the wrong season which are the worst conditions. Aim for low tide and you have a better chance of seeing them in the cooler months. In summer, when we visited, the water is super warm so the crocodiles are more likely to be submerged. On the upside, we did see more of the Daintree and the guide did a good job of introducing us to the wildlife and plants around the river. He had lived there his whole life and had lots of stories of how things used to be which brought the area alive. To me, it feels like there are two parts of the Daintree which are separated by the Daintree River. To get across the river, you need to take a car ferry. Since we combined our trip to the Daintree with a trip to Mossman Gorge, we only had time to explore the south side which I regret. 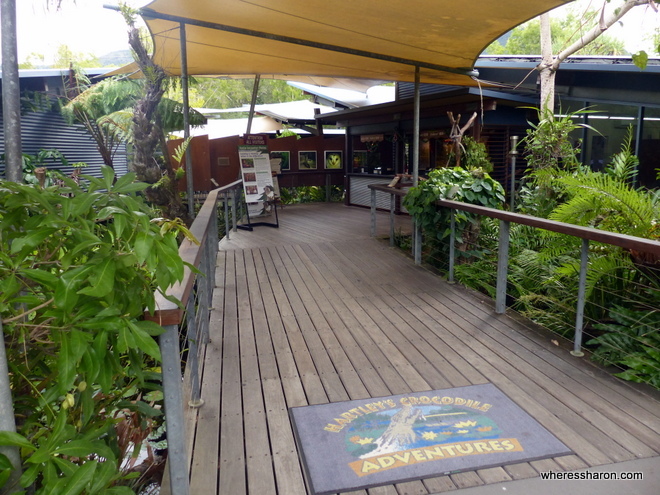 Take more time than we did and head over the river to see more including the Daintree discovery centre. You can find more information about the crocodile cruise we did here. It was $65 for a family ticket. There is 10% off if you book online. We couldn’t visit the Daintree without knocking off one of Australia’s “big” attractions – the Big Barramundi. 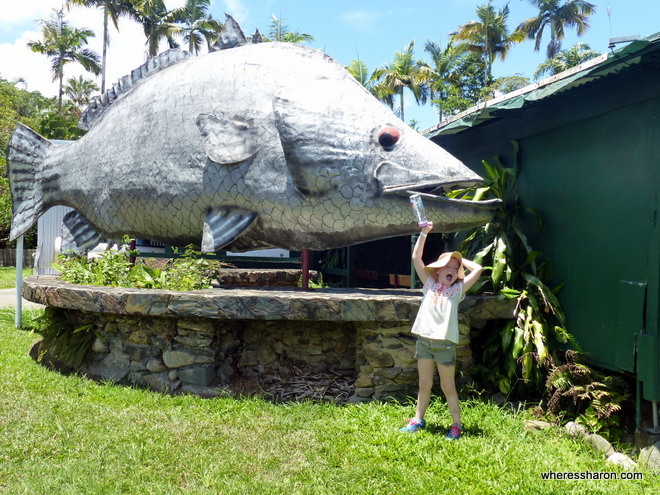 This big fish is located in Daintree Village so a very easy Daintree attraction to include with a Daintree River cruise. There’s an attached restaurant with simple food and surrounds. We had “big barra burgers” which were delicious. Palm Cove is a beach area about 30 minutes north of Cairns. It’s a popular spot to stay (which we did) and we just loved it. The beach is pretty and had the beautiful blue tropical looking water that you always see in photos of these places. There is not a lot of things to do, but it is a nice beach with many places to eat and have a drink. There is also a playground. It’s a popular area for families and we saw more prams here than anywhere else. It’s possible to catch a public bus here from Cairns. 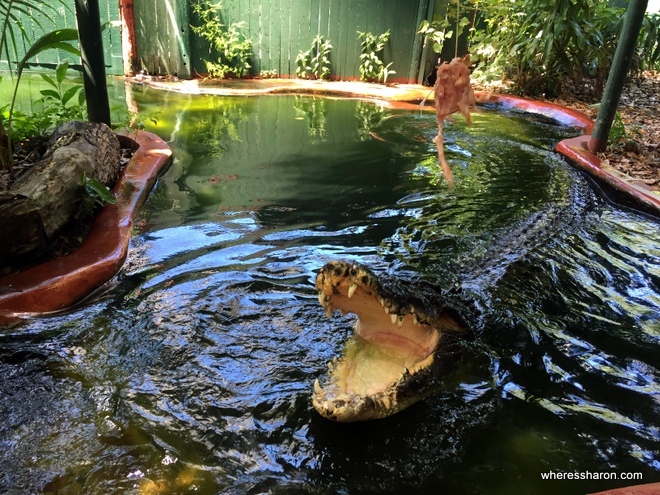 North of Cairns and shrouded in nature is Hartleys Crocodile Adventure. This is probably the best place to experience the wildlife in Cairns. The park features a range of wildlife, but the best known attraction is the salt water crocodile. This turned out to be a fantastic and entertaining day for both us and the kids. The park is easy to explore with paths through the rainforest and woodlands immersed in local wildlife. The fauna is an interesting part of the park, and the wildlife presentations were all interesting and entertaining and make the park come alive. This is another great place to get up close to a crocodile without losing a limb! In addition to crocs there are snakes, cassowaries, koalas and kangaroos which you can get up close to and feed. This is also the chance to get a photo with a koala. The boat cruise on Hartleys Lagoon is another way to see crocodiles. The open air boat goes through murky waters and is again a bit too close for comfort. This is a fantastic way to spend the day, and it was just as entertaining for us as it was for the kids. Open daily from 8:30am to 5:00pm. You can find entry prices on their website, and family prices are available. Port Douglas is a lovely upmarket beach resort style town about an hour’s drive north of Cairns. There are quite a few Port Douglas kids activities here including Four Mile Beach, Wildlife Habitat and Bally Hooley Steam Railway. You can read more about these attractions in my guide to Port Douglas. 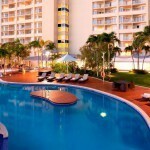 The trickiest part of planning a trip to Cairns is working out where to stay. This because there are many options! The first question to answer is which area to stay. The three main options of where to stay in Cairns Australia are Cairns itself, Port Douglas and the northern beaches of Cairns, particularly Palm Cove. All these areas are quite different and it’s worth pointing out something here that I didn’t realise the first time I visited this part of the world. That is that Port Douglas is not part of Cairns at all. It’s about an hour’s drive from Cairns and is quite separate. This means it’s important when weighing up whether you want to stay in Port Douglas or Cairns to consider what activities you want to do. 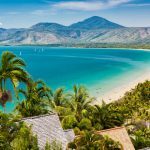 The first time I visited this region, I stayed in Port Douglas and, although I liked it very much, I spent a lot of time in buses and it was annoying. It also significantly increases the price of your trip as you are constantly travelling elsewhere. Transfers are not cheap and, as a family, you will definitely be better off hiring a car. We were able to get away without hiring a car in Cairns. Otherwise, I do love Port Douglas. It’s beautiful, there’s a great beach right there and a lively shopping strip. It’s a convenient spot for visiting the Outer Reef (it’s closer to Port Douglas), the Daintree and Mossman Gorge. It is very touristy, more expensive and is an up market beach resort town. This will suit some people and not others. You can read my full guide to Port Douglas here. Cairns feels more “real”. It’s still touristy but with a lot more locals around. There’s also more shops, restaurants, everything really. There a ton of backpackers in Cairns. There is no beach, but the Cairns Lagoon helps to make up for that. It’s more central to everything else listed in the things to do in Cairns section of this article than Port Douglas, except the attractions noted above. Palm Cove, one of the Northern beaches of Cairns, is kind of in the middle of these two options. It’s about 30 minutes North from Cairns on the way to Port Douglas. 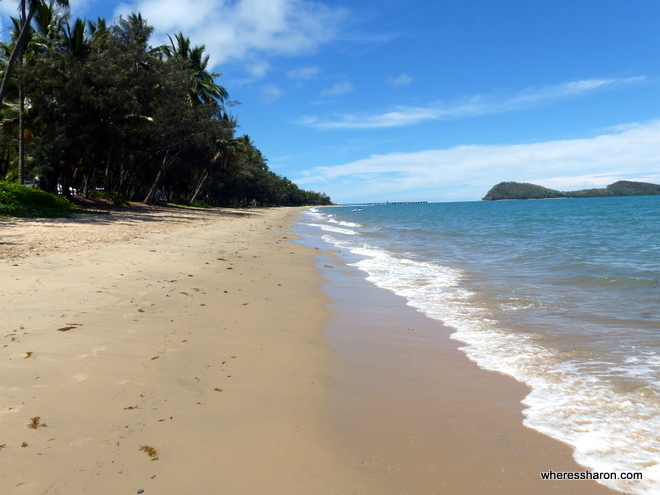 It has a lovely beach and what I like about this beach over the one in Port Douglas is that the road runs along it and there are lots of places to eat where you can enjoy looking at the beach and views of the area. It’s not as big as the beach in Port Douglas though. The good news is all of these areas are great and there’s no problems finding Cairns family accommodation in all of them and you can’t go too wrong as long as you consider whether you want to be near a beach and how far from Cairns family activities you are happy to be. 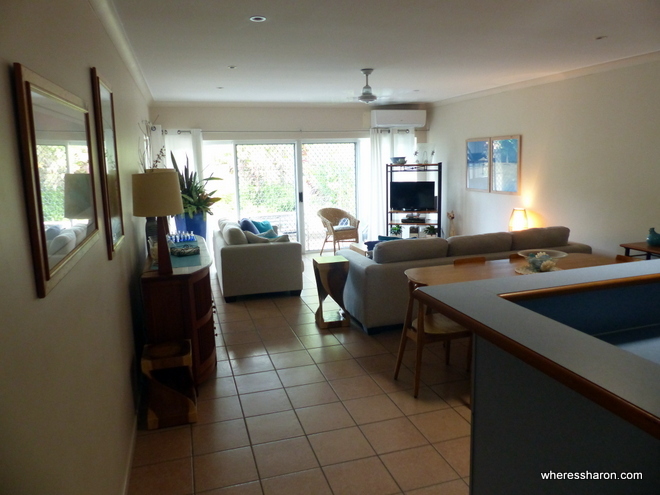 Finding central accommodation in Cairns with kids is tricky. We ended up staying in North Cairns which meant we had to catch lots of taxis, but this still ended up more economical than staying closer to the centre. After a few nights in Cairns, we moved onto Palm Cove. We stayed at The Villas Palm Cove which we absolutely loved. 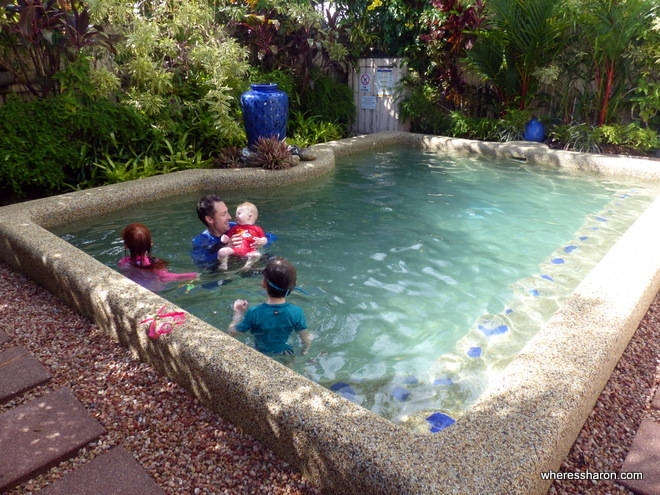 It’s our pick of the best place to stay in Cairns with kids. Our private pool at The Palms. Just perfect! I was in love with our two bedroom, private pool villa at The Villas Palm Cove from the moment we pulled into it’s private garage! It’s large with plenty of space for the five of us. There’s an open plan kitchen, dining and lounge area with big, comfortable couches, a large dining table and an awesome kitchen with tons of space and well equipped. It all looked into our beautiful back year with pool. There was also two decent sized bedrooms, plenty of cupboard space and two bathrooms. One also contained laundry facilities. There’s air conditioning units in the two bedrooms and lounge as well as fans. They were very effective. I would have loved the villa even without the beautiful outside, but it is definitely the highlight. There is an outside table and chairs which is undercover and fenced off from the pool. The pool area was just beautiful with lots of greenery, a decent sized pool and some lounge chairs. I was just in heaven. The whole villa was spacious and incredibly private. We felt alone in our own private oasis and I didn’t want to leave! There’s also a larger pool from the resort, but we did not want to leave our private one to try it out. The only downside is that it is a bit of a walk from the beach. Google maps says only 10 minutes, but it felt a bit too far to walk with little legs. We had a hire car at this part of the trip so this wasn’t an issue for us. One of the best parts about all of this is that it is very reasonably priced. We paid only $290 a night for a family of 5 and we were there at the mega peak time over New Years Eve. We loved it so much that I can see us returning to Cairns just to stay here. 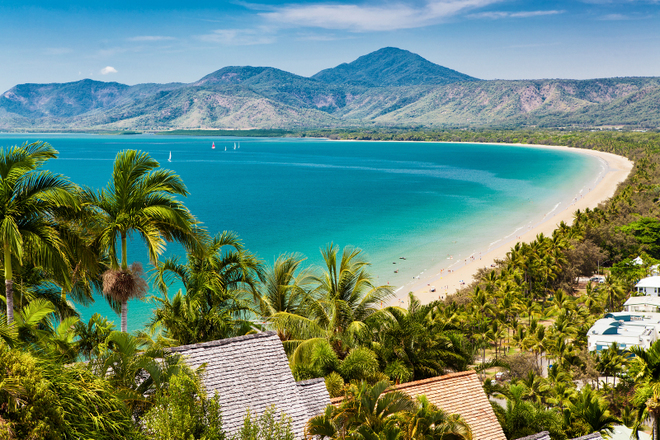 Click here to see a list of all the best family accommodation in Cairns and Port Douglas. We visited Cairns with our 6 month old and 4 and 6 year olds. We think it’s a fabulous destination with kids. It’s easy to get around, everything is very modern and pram friendly and our kids were welcome everywhere we visited. We visited all the main attractions whether you have kids or not and we found them all to be kid friendly with plenty for our kids to enjoy as well. It helps that many of the things to do in Cairns are outdoors. Our kids had a great time. They just kept mentioning places when I asked them what their favourite things are. There was a massive yes when I asked them if other kids should come here too. I was very pleasantly surprised by the great food we ate in Cairns. Admittedly, we did self cater or eat whatever we could find at attractions a lot, but we still did manage to find some great meals which compared very favourably to ones we have eaten in some of our favourite eating spots in the world. Tandoori Nights – This Indian place was fantastic. Great curries and the kids meals are fabulous. For $10 the kids got a ton of rice, curry, some naan, a papadum and a drink. Sushi Train – We love sushi train restaurants but unfortunately haven’t come across one since leaving Malaysia nearly a year ago. This one serves absolutely delicious sushi. 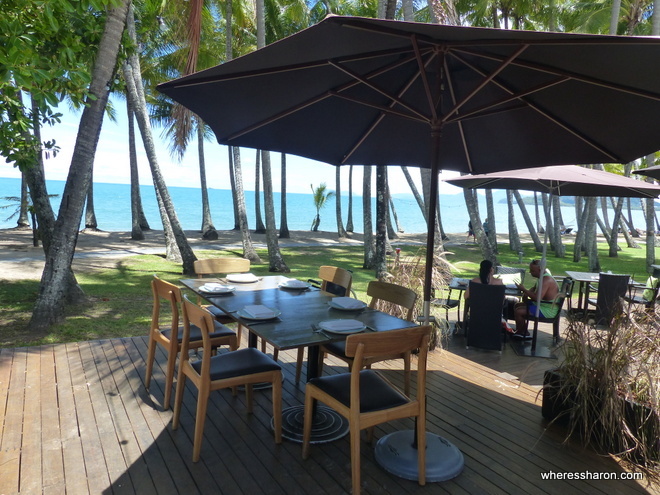 Nu Nu – Lovely beachfront cafe in Palm Cove with some great kids’ meals and interesting menu. Star of Siam – Some of the best Thai food I have eaten outside of Thailand. 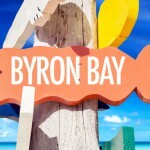 It’s located in Clifton Beach and they deliver to Palm Cove. The best way to get around Cairns and surrounding areas is to bring your own car or to hire one. Most the attractions on here you can visit on day tours or the attractions themselves can organise transfers. However, these can be crazy expensive for a family and you’ll probably find car hire cheaper. There are public buses around Cairns and the Northern Beaches. However, these never seemed to go where we wanted without a lot of mucking around. We combined using taxis with car hire. Now we have three kids that need car seats, car hire gets very expensive. We find it too hard to travel with more than one car seat so we have to hire two plus hire a big car so they will all fit! For this reason, we hired a car for a few days only for the things for kids to do in Cairns which were further out and used taxis the rest of our time. Taxis are not cheap – I advise not looking at the meter as it moves so fast! However, for attractions anywhere near Cairns, they were still cheaper for us as a family than car hire or buying transfers. I do warn you if you have three kids, even if one is a baby and sitting on your lap, they will not allow five people to hire a normal size taxi. It was very frustrating to not be allowed to take all of us in one taxi even though there was a free seat! The only real complaint I have about Cairns is that it is not cheap. I would not say it is expensive either, but then I am Australian. Everything was on par with what I am used to spending. The problem is that there are so many fabulous things to do in Cairns for families and the price very much adds up. If you are trying to prioritise the attractions then the kids’ favourite things to do were the duck tour at Rainforestation, the Skyrail, the day on Green Island, the Cultural Creations at Tjapukai Aboriginal Theme Park and snorkelling on the Outer Reef. Unfortunately, these are also the most expensive attractions, but you do get what you pay for. My biggest budget tip for visiting Cairns is to consider buying an Entertainment Book. This is a book that is full of coupons for specific areas in Australia. So many of the family activities in Cairns are in this book, usually with a 25% discount. We had many times where the discount for just a single attraction saved us more than the cost of the book! We used it for Rainforestation, the day tour to Green Island, the snorkelling trip to the Outer Reef, Tjapukai Aboriginal Theme Park and many other things as well as for a few of our meals and car hire! We also used it to save money in Townsville. You can also save money on tickets by purchasing them online at Klook. We use this site a lot and have found them fantastic for saving money on attractions in Asia and Australia. Click here to see the attractions offered in Cairns. We loved our time in Cairns and surrounding areas. It’s the perfect place for a family adventure or a family vacation. There are amazing attractions, beautiful beaches and lovely resorts. You can relax and just enjoy time together or fill your days with amazing experiences. We just loved it. Cairns is in the tropics and this is obvious the moment you hop off the plane. It’s hot and humid. Fortunately for us, although visiting in wet season, we did not see rain. I kept feeling like I was back in South East Asia, where we have spent a ton of time. Then I would be surprised when I would be served in Australian English or by how familiar and modern everything is! It is a great alternative to an Asian destination. For us Australians, it’s much easier to visit. It does, however, cost substantially more. We found the cost worthwhile. We loved so many of the places we visited that I find it hard to have a stand out. A good visit to the outer reef of the Great Barrier Reef is always going to win. It really is amazing and on a nice day, it feels like you are swimming around in Finding Nemo. I also love Green Island (as did the kids). Another big highlight for me was Tjapukai Aboriginal Cultural Park. It’s sad, really, that I have not come across more opportunities to learn about Aboriginal culture from Aborigines themselves and it really made this place a standout. All in all, we loved it in Cairns and hope to come back some day soon. You can also read all our other Australian travel guides here, as well as our guide to the best family accommodation in Cairns here and our guide to Townsville here. Disclaimer: This article contains affiliate links. If you make a booking after clicking on one then we may receive a small commission at no extra cost to you. A big thank you for helping support our site. We loved Mossman gorge when we were there. Didn’t have enough time to see as many attractions as you though! Thank you for this! Been researching on how to travel and enjoy GBR with a 6 yr old. Hubby and I wanted the reef walk but cant do it together with the kid tow. I bookmarked this page to explore other options.